TORONTO , Sept. 12, 2018 /CNW/ - Sable Resources (SAE.V) (the "Company" or "Sable") is pleased to announce results from drillholes 9 to 12 targeting the Margarita Vein from its ongoing 12-hole drill program at the Margarita Project, Chihuahua State, Mexico . Drillholes M-DDH-18-11 and M-DDH-18-12 are a 250m step-out to the northwest from previously released holes M-DDH-18-05 and M-DDH-18-07. Hole M-DDH-18-09 is located on the same section line than previously released drillhole M-DDH-18-04. Drillhole M-DDH-18-10 is located on the same section line as previously released drillholes DDH-18-06 and 08. These latest results confirm continuity of the Margarita structure over a strike length of 750m . 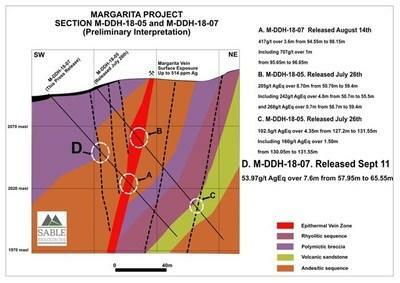 In addition to the high-grade Margarita structure, Sable has identified a low-grade stockwork style of mineralisation evident in numerous holes. Mineralized core from previous holes has been assayed with encouraging results. "We are very pleased to have been able to identify this additional style of mineralization giving us a secondary lower-grade target close to surface as well as the high-grade Margarita structure." commented Ruben Padilla Vice President of Exploration for Sable. "With the first stage of drilling now complete we will evaluate our results and formulate a plan for stage 2 drilling targeting further extensions of Margarita and the other adjacent parallel veins"
Acquired as part of Sable Resources Upper Level Epithermal Strategy, the Margarita Project is located in the Satevó Municipality in Chihuahua state, approximately 120km SW of the state capital of Chihuahua City, and 110km NNW of the historic Parral mining district. The Project is located 15km northwest of Sunshine Silver Corp.'s Los Gatos Project, which hosts a 256 million ounces silver-equivalent resource (Pyle. P (2018) Los Gatos Project: Epithermal silver, zinc lead discovery in south Central Chihuahua. Minera Plata Real , Los Gatos Joint Venture Presentation). Hosted in Eocene-Oligocene Volcanics, Margarita is defined by 4 veins; Margarita, El Caido, Juliana and Marie on 2 claims totally encompassed by Sunshine Silver . Sample preparation was carried out by ALS Chemex de Mexico S.A. de C.V., a subsidiary of ALS Minerals, at their laboratory at Chihuahua, State of Chihuahua , Mexico. Analyses were carried out at their laboratory in North Vancouver, British Columbia , Canada. Sample preparation was by drying in an oven at a maximum temperature of 60°C, fine crushing of the sample to at least 70% passing less than 2 mm, sample splitting using a riffle splitter, and pulverizing a 250 g split to at least 85% passing 75 microns (code PREP-31). True widths are estimated to be 90% of the intercept based on vein to core angle. Detailed drill results, location plan, and sections are available from the Sable website. Silver equivalent is calculated based on USD15 .50per Oz for Silver, USD 0.95 per pound for Lead and USD1.20 per pound for Zinc and USD1200 for gold, considering 100% recovery a (((Au_PPM*38.58)+(Ag_PPM*0.498)+(Pb%*20.94)+(Zn%*26.46))/0.498). * Weighted average composites. All other intervals are actual results.